Vol. III = Outtakes and Alternate mixes Album "461 Ocean Boulevard"
After an extremely busy 1970 ended, Clapton entered a period of relative retirement. His participation in the Concert For Bangladesh in New York 1971 was one of the few appearances. Polydor compensated by flooding the market with Eric Clapton product including the compilation LPs The History Of Eric Clapton in March 1972, Eric Clapton At His Best in September 1972, and Eric Clapton in 1973 and live albums such as In Concert (Derek And The Dominos) in January and Eric Clapton’s Rainbow Concert, both in 1973. He entered the studio for his follow up in April and May, 1974 in Criteria Studios in Miami, Florida. The resultant album 461 Ocean Boulevard was released in July. It hit number one on Billboard in the US and as high as three in the UK, and “I Shot The Sheriff” also hit number one on the single charts. The outtakes are more interesting than those for Eric Clapton, which consisted mostly of remixes. Many long jam sessions are features on this discs, recorded by a band who were in the process of working with one another. Except for Carl Radle, who handled bass for Derek And The Dominos, the other musicians had not worked with Clapton before. Jam sessions of “Motherless Children” start off the sessions. The first track bears a passing resemblance to the song, but the second take shares the final arrangement except is in the key of E. A cover of Willie Dixon’s “Meet Me” follow. The first two are seven minute long instrumental runthroughs. The third is the final take with lyrics that appeared first on The Blues in 1999 and on the 2004 deluxe edition of 461 Ocean Boulevard. The instrumental ”I Shot The Sheriff” lasts for almost seven minutes and is the basis for the studio version. Of course this lack vocals, but it does include the guitar solo that isn’t present on the studio release. George Terry singing “Mainline Florida” follows. This is Terry’s sole writing contribution to the album, and this sound like a rough studio run-through without any embellishments. Terry himself has a good voice, and has fun shouting “rockets” during the instrumental passages. Several instrumentals follow on the disc. “Let It Grow” and “I Can’t Hold Out” sound like the instrumental tracks used for the official release. Two four minute long instrumentals, one in “A” and one in “G,” follow and sound like the improvs that would be used on stage in the subsequent tour. Following is an amateur demo of “Please Be With Me.” It’s a simple recording of Clapton and Terry playing the tune and singing the words. 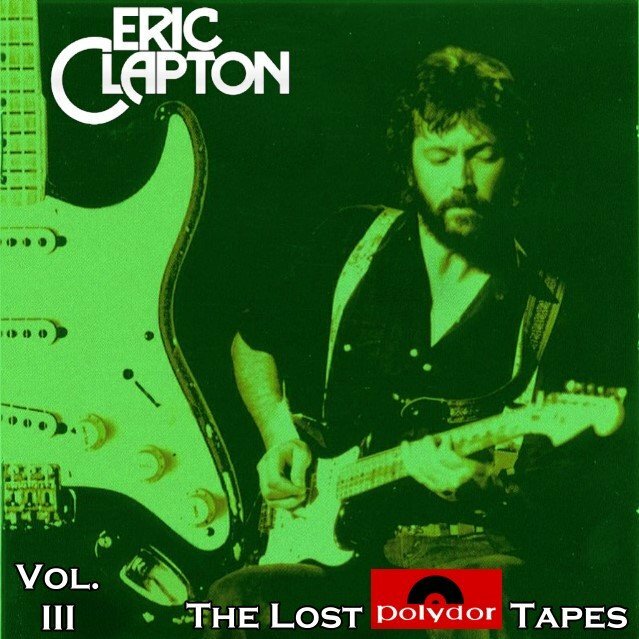 “Gypsy” is an version of “Please Be With Me” which features Clapton alone with the acoustic guitar, in contrast with the polished full band recording found on the album. The disc ends with the Jimmy Reed cover “Ain’t That Loving You.” It’s a polished outtake that first appeared on Crossroads 2 and subsequently on the 2004 461 Ocean Boulevard deluxe edition as an extra track. 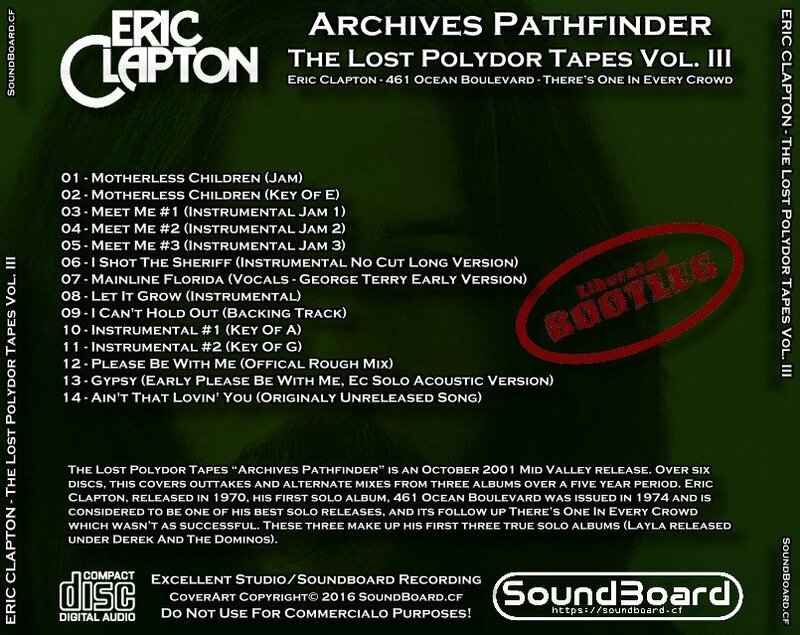 The Lost Polydor Tapes Vol. III 0 out of 5 based on 0 ratings. 0 user reviews.